With the support of our adept team of professionals, we bring forth a broad assortment of PTFE Insulated Electrical Sleeves. Our offered sleeves are fabricated at our well-established production houses using supreme quality component under the guidance of their skilled professional and current technology to ensure its flawless users' end. These sleeves are offered in different specifications as per the application requirements of the clients. Further, our offered sleeves are supplied within the stipulated time - frame to our clients. 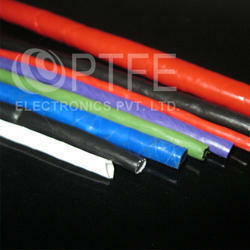 We offer a very sturdy range of PTFE Electrical Sleeve that are reckoned for high dielectric strength. Manufactured from cutting edge technology our product in this category is highly sought after for such features as durability, dimensional accuracy and perfect design parameters. The range, in addition is resistant to abrasion, heat and wear and tear. 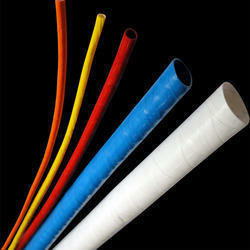 With the support of our adept team of professionals, we bring forth a broad assortment of PTFE Sleeves. Our offered sleeves are fabricated at our well-established production houses using supreme quality component under the guidance of their skilled professional and current technology to ensure its flawless users' end. These sleeves are offered in different specifications as per the application requirements of the clients. Further, our offered sleeves are supplied within the stipulated time - frame to our clients. Colors: All 11 solid standard colors and Natural opaque. Bicolor and color Stripping is also available. 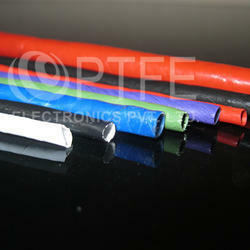 We manufacture LCSO Approved PTFE sleeves and tubing as per the requirements of Indian Defence Standard JSS 54802. Made from PTFE tape wrapping and sintering process these sleeves are more flexible, high tear resistance and are mechanically more stable. All 11 solid standard colours and Natural opaque. Bicolour and colour Stripping is also available.